Dermal anchoring is a single-point pocketing. A small core of skin is extracted using a dermal punch. A small anchor is then inserted under the skin with the top attached with internal threading. It looks like a small single top(usually a gem stone)on the skin. It is a very simple procedure to have a dermal anchor implanted under your skin. It can be installed almost anywhere on the body. The footing, which is under your skin, has holes in it that your body will grow into and anchor itself into place. Until it has been “anchored” and accepted by your body you will need to be very gentle as to not snag and pull it out. I recommend bandaging the anchor while at home and while sleeping for the first few weeks. Dermal anchors that I install are made out of grade 23 titanium. Titanium is the only material acceptable for implantation of dermal anchors. 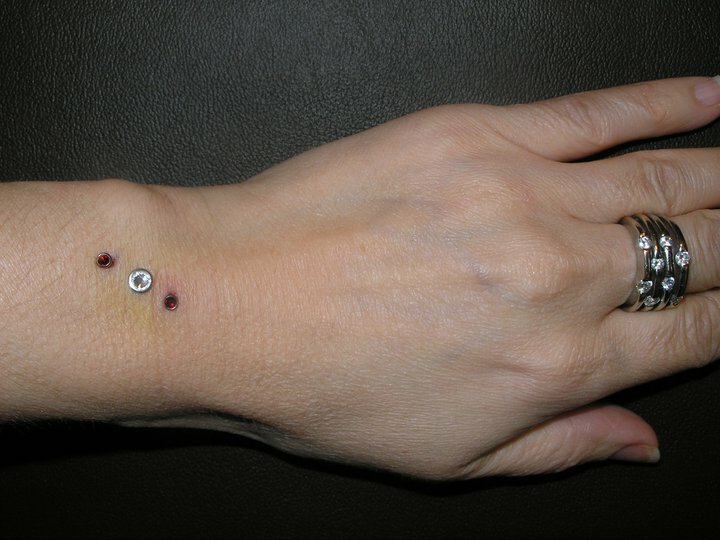 I also sell a variety of different tops to the dermal anchors that are interchangeable with a universal threading. I recommend that dermal tops not be changed for one year from the time of installation. This gives the skin time to completely grow into the anchor. And remember anytime you buy jewelry from me, I change it for free! Removing dermal anchors is not as difficult as you may think. In most cases they may need to be removed with a very small incision. These are small so they are not going to leave a huge scar and in time, become nearly unnoticeable.